As parents of identical twins will tell you, they are never actually identical, even though they have the same genes. This is also true in the plant world. Now, new research by the University of Cambridge is helping to explain why ‘twin’ plants, with identical genes, grown in identical environments continue to display unique characteristics all of their own. Plant scientists at the Sainsbury Laboratory Cambridge University (SLCU) have built a gene expression atlas that maps the ‘noisy genes’ of genetically identical plants. The research, published today in Molecular Systems Biology, found that around 9% of the genes in otherwise identical plants are highly variable in the way that they behave. Interestingly, many of these highly variable (noisiest) genes help a plant respond to its environment, including genes involved in reacting to light, temperature, pathogens and nutrients. This variation in gene behaviour could be useful in nature for populations of genetically similar plants to hedge against environmental stress such as drought, high salinity or extreme temperatures. This means that there will always a few plants in the population that are prepared to survive different stresses due to their variable gene behaviours (hedging their bets). But this variability can also be a problem, such as in agriculture where environments are more controlled and farmers want uniform crops that germinate and flower at the same time and respond equally to applications of fertilisers and water. Dr Sandra Cortijo, from the Locke Group at SLCU, is researching how gene expression is regulated and what causes some genes to be expressed in unpredictable ways. To examine this, Cortijo took on the mammoth task of measuring global levels of noise in gene expression in a single plant species. 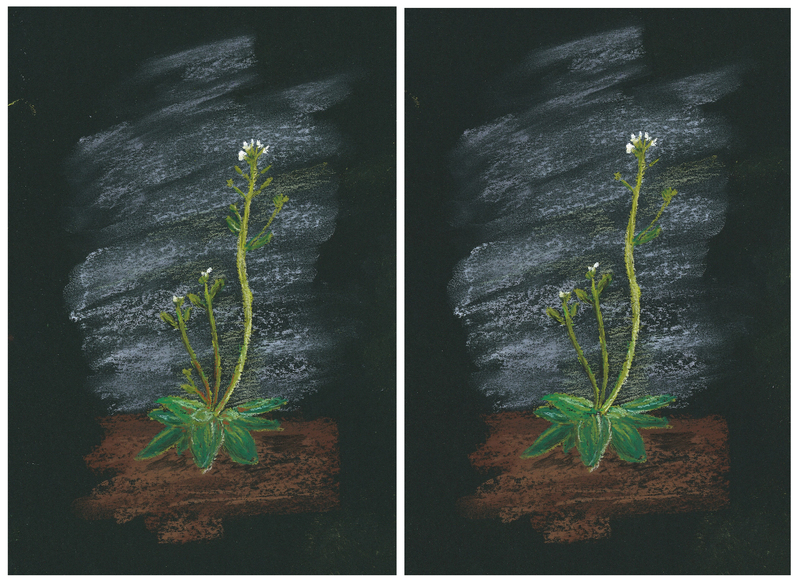 Using genetically identical plants, she measured the expression of all their individual genes over a 24-hour period. 'For our model plant, we used seedlings of a small wild brassica relative, called thale cress (Arabidopsis thaliana), which is most commonly seen growing as a weed in the cracks of pavements,' Cortijo said. 'We performed RNA-sequencing on individual seedlings every two hours over a 24-hour period and analysed the variability for 15,646 individual genes in the plant’s genome. As part of the study, Cortijo also identified factors that might increase gene expression variability. Highly variable genes tend to be shorter, to be targeted by a higher number of other genes (transcription factors) and to be characterised by a ‘closed’ chromatin environment (which is an environment that allows gene expression to be altered by attaching additional molecules during the gene reading process (transcription) without actually changing a cell’s DNA). 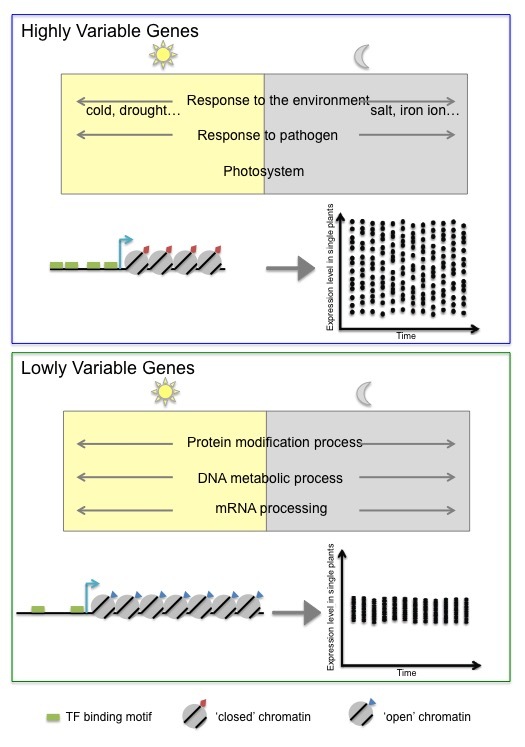 'These results shed new light on the impact of transcriptional variability in gene expression regulation in plants and can be used as a foundation for further studies into how noisy genes are connected with how plants respond to their environment,' Cortijo said. 'Plants are a wonderful system to work with when looking at how genes are regulated in response to environmental changes as they cannot move and thus have to continually sense and respond to environmental changes. This research was supported by a fellowship from the Gatsby Charitable Foundation. The Locke Group is also further supported by the European Research Council. AraNoisy is a web-based tool for accessing inter-individual transcriptional variability in Arabidopsis thaliana, throughout a 24-hour diurnal cycle. Gene expression variability for individual genes of interest can be viewed here. 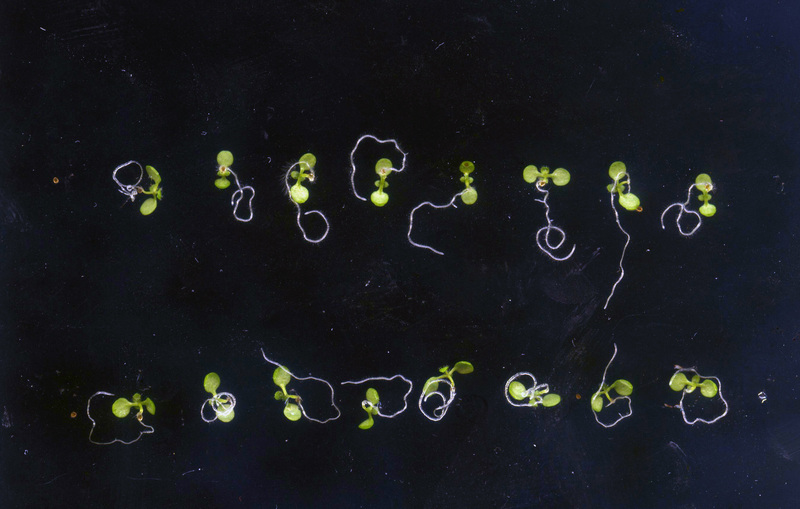 Spot the difference: Genetically identical thale cress plants grown under the exact same environmental conditions show significant visible differences. Could this be due to variable gene expression?